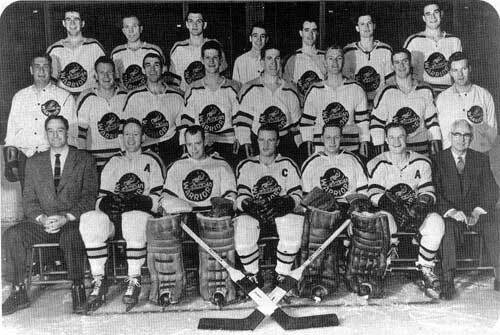 Winnipeg Warriors, 1955-56, champions of the Western Hockey League. J. D. (Jack) Perrin Jr, vice-president and general manager, is seated bottow row left. J. D. Perrin Sr., the club president, is seated bottom row right. Members of the Warriors that year included future NHL coach Fred Shero (seated centre) and future NHLers Eric Nesterenko (second row fourth from left), and Ed Chadwick, third from right, bottom row. A list of the most important clubs in the history of hockey might include the Renfrew Millionaires, Ottawa Senators, Montreal Canadiens, Toronto Maple Leafs, Detroit Red Wings, Central Red Army, but certainly not the Winnipeg Warriors. The Winnipeg Warriors were a professional team that lasted only six years. They played in a minor league that existed for less than thirty years. They did not pioneer a new style of play; they did not even excel at an old one. The Warriors’ story is insignificant in itself. But the history of the club is instructive because by examining it we can learn about the business of professional hockey in the 1950s and 1960s, and especially about the impact of television on minor professional hockey franchises. 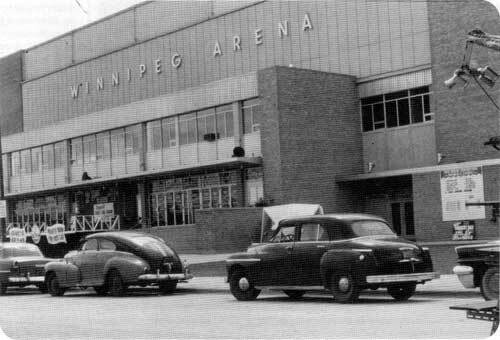 Winnipeg Arena, 1958. The arena was constructed in the mid-1950s and could seat over 9,000 people. It is hard to imagine a more profitable minor pro franchise than the Winnipeg Warriors in 1955-56. Over the next five years, however, the Warriors were a much less lucrative investment. 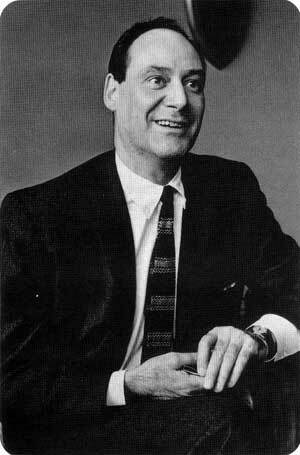 The Perrins lost money in 1956-1957 and in nearly every season thereafter. The 1960-61 campaign was a disaster. The last four home games attracted hardly anyone aside from players on youth hockey teams and others with complimentary passes; and average attendance for the season was about 2,000, less than half the number required to break even. In the summer of 1961, when Jack Perrin folded the team, it was estimated that the total loss on the Warriors’ operations over six years was about $200,000.00. What caused this reversal in the fortunes of the franchise? A better rental arrangement could have had only a minor impact on the Warriors’ financial situation, however. A more important reason the hockey club became unprofitable is that in terms of victories and defeats it never again performed as well as it had in the first season. Twice it finished in last place, once in second-last. It made the playoffs in only two of the five final seasons, and only once made it past the first round. In specific seasons there were specific problemsbad goaltending, poor coaching, and so onbut one can generalize by saying that the most constant shortcoming was inferior players. And the main reason Winnipeg had inferior players was that it did not receive much help from NHL clubs. This was partly Jack Perrin’s own fault. In 1955 he made a two-year deal with the Montreal Canadiens and Toronto Maple Leafs by which the two NHL clubs agreed to provide the Warriors with fifteen players of WHL caliber while the NHL clubs would split 50% of the Warriors’ aggregate profits. The agreement worked well in 1955-1956, but in 1956-1957 Toronto and Montreal were more interested in placing players on their respective American League clubs in Rochester and Cleveland. In this latter season the Warriors finished last in the Prairie Division of the WHL, and Jack Perrin wasn’t happy. He sued the Toronto and Montreal clubs and eventually won. Justice A. M. Monnin of the Manitoba’s Court of Queen’s Bench found that for a while the Warriors were two players short of the required fifteen (he found it difficult to decide if Toronto or Montreal or anyone else could have known before the season began that some of the players they sent to Winnipeg would not be of WHL caliber). Now, Perrin won only $26,000.00, not the $125,000.00 he was asking for, but it is not surprising that after 1957 Toronto and Montreal did not work with Winnipeg. During the last four seasons the Warriors existed, some player help came from Boston and New York, but both the Bruins and the Rangers had obligations to other minor pro teams. For the most part Jack Perrin owned his own players, often youngsters who moved up from one of the junior teams he operated in metropolitan Winnipeg. A few of these young pros played wellArt Stratton, for example, and Ted Green before he was picked up by Bostonbut most of them were out of their depths in the Western League, and certainly Winnipeg could have used an NHL affiliation that would have given them the kind of players which, in the late ‘50s, Detroit was placing in Edmonton, or Chicago in Calgary, or New York in Vancouver. Weak teams were not the only reason attendance was down, however. Even in the years the Warriors made the playoffs, fan support and revenues were disappointing. The main reason was competition from televised NHL games. We know a certain amount about the impact of television on various sports in the 1950s and 1960s, before such technical innovations as color, instant replays, slow motion, isolation cameras, and telestrators, before cable had become of much consequence, and long before satellites and pay-per-view. Television had a positive influence on football, pro wrestling, and roller derby. It had a mixed impact on boxing, because it enabled top fighters and big promoters to make more money on major events than ever before, but it caused attendance at local fights to drop. It had a mixed impact, as well, on baseball and hockey, the two North American sports with a well-developed, integrated, major league / minor league structure. The Winnipeg Warriors, like other minor pro teams, senior teams, intermediate teams, junior teams, and even children’s teams, discovered that “you couldn’t run a game on Saturday night.”  Hockey fans in Winnipeg and across Canada had been following the NHL for decades through newspaper and magazine stories, and through radio broadcasts. Now, in the late ‘50s, they had a chance to view the games, as well as hear the familiar voices of Foster Hewitt or Danny Gallivan describe them. They had a chance to see established stars such as Sawchuk, Plante, Howe, Lindsay, Richard, and Harvey, as well as new ones such as Mahovlich and Hull. They became aficionados of first-rate hockey, and they became impatient with, and even condescending toward, second or third rate hockey. After they had seen Jean Beliveau and the Montreal Canadiens ten or twelve times, Guyle Fielder and the Seattle Totems became much less impressive than they once had been. Television hurt minor professional hockey franchises all over Canada. It did so especially in the early 1960s, by which time there were NHL games broadcast on Saturday night, on Wednesday night (on CTV), and on most nights of the week at playoff time. Canadian minor league teamsbegan to escape television by relocating in the USA, where there were huge cities with thousands of potential fans, where the big networks were not yet very interested in hockey, and where teams could use local independent stations to televise away games and thereby increase revenues and stimulate interest. Television was a major reason that the Eastern Professional Hockey League, a league formed in the late 1950s which represented a mutation of the old Quebec Pro League and which had teams in cities such as Kingston, Hull-Ottawa, Sudbury, and Sault Ste. Marie, was transformed by the mid-1960s into the Central Pro League, with teams in American cities such as St. Louis, Omaha, St. Paul, Kansas City, and Memphis. Turning our attention to the Western League, television was an important reason that the New Westminster franchise moved to Portland in 1960, that the Victoria operation moved to Los Angeles in 1961, that the Calgary and Edmonton clubs folded in 1963. In short, television was a major cause of the transformation of the Western League of the mid-1950s, which was a Canadian league with one U.S. city (Seattle), into the Western League of the mid-1960s, which was a U.S. league with two Canadian cities (Vancouver and Victoria). By the time the Western League folded or, to be more precise, partially merged with the Central Pro League in 1974, it had no Canadian franchises at all. This is where the second difficulty came into play the situation regarding Sunday sports in Manitoba. In the mid-1950s, when the Warriors were formed, no commercial sport on Sunday was allowed in the province. Amateur sports events took place (especially baseball games in summer) but no admission charge could be levied at the gate. Amateur clubs broke the letter of the law by arranging for hats and caps to be passed around while a match was in progress; the spectators voluntarily dropped coins or bills into the headpieces. But “passing the hat” was not a realistic option for a pro club. The revenue potential of doing so was low, for one thing. For another, many, and perhaps most Manitobans, considered Sunday a religious holiday and, although they were becoming more tolerant of family-oriented leisure activities held on the Sabbath, they still did not approve of holding commercialized leisure events on that day. According to John Perrin III, the son of Jack Perrin, television was a “major problem” for the Warriors, although of course it was not the only problem the club faced. Televised NHL hockey competed with Warriors’ games for support, and did so especially on a night of the week which, given local circumstances, the Warriors needed. In hockey as in music, dance, and other activities, television made it possible for high calibre performances or productions that occurred in metropolitan centres to undermine and even to replace the lower calibre ones that occurred in the hinterlands. But the establishment of the World Hockey Association, and of the Winnipeg Jets as part of that league, were more than a decade away when Jack Perrin folded his minor league team. He was one of the first Western Canadians to confront a fact that everyone now recognizes. Television had changed the business of pro sports forever. The author wishes to acknowledge assistance received in preparing this paper from Maureen Cousins, Mark Bednorski, Kurt Refvik, Tom Thompson, Gerald Friesen, Jack Bumsted, and Gerhard Ens. 1. The Warrior name and logo were revived by a junior team which operated in Winnipeg from 1980 to 1984. This Winnipeg Warriors team is now the Moose Jaw Warriors. The junior team used the Warriors’ name and logo, but was otherwise unrelated to the pro club. 2. The Hockey News (hereafter HN), 23 April 1955, July 1967; Saskatoon Star-Phoenix, 24 February 1959. 3. HN, 2 October 1954; Gary W. Zeman, Alberta On Ice: The History of Hockey in Alberta Since 1893 (Edmonton: GMS Ventures Inc., 1986), p. 61; Brenda Zeman, 88 Years of Puck Chasing in Saskatchewan (Regina: WDS Associates and the Saskatchewan Sports Hall of Fame, 1983), p. 88. 4. HN, 2 October 1959, 6 November 1954, 5 February 1955, 29 October 1955; Winnipeg Free Press (hereafter FP), 5 March 1955, 15 September 1955, 18 October 1955, 19 October 1955. The Winnipeg Arena, altered in 1979, is still used for pro hockey in Winnipeg. 5. Telephone interview with John Perrin, III, 29 May 1992. P. J. Sloane’s observation that many owners have been “utility” maximizers rather than “profit” maximizers is relevant here. See “Restriction of Competition in Professional Team Sports,” Bulletin of Economic Research, vol. 28, 1976, especially p. 4. On John Perrin, Sr., see Provincial Library of Manitoba, Manitoba Biographical Scrapbooks, B10, p. 24; on John Perrin, Jr., see B19, pp. 124-125, FP, 22 November 1992. 6. FP, 19 October 1955, 17 March 1956, 4 May 1956. 7. The Warriors “break-even” attendance for a regular season game was about 4300. They drew an average of over 5800 per game, including playoffs. The average price of a ticket was $1.25. If the profit per game was 1500 x $1.25 or $18775.00, then the total profit would have been over $80,000.00. But these are very rough calculations, and take no account of extra travel costs for playoff games. 8. FP, 19 March 1956, 23 April 1956, 4 May 1956; HN, 10 January 1959. 9. Short biographies of some of these players can be found in hockey encyclopedias, for example in Stan and Shirley Fischler, Fischlers’ Ice Hockey Encyclopedia, revised edition (New York: Thomas Y. Crowell Company, 1979). Much of this information comes from conversations over the years with old Western League players such as Elliot Chorley of Brandon, Jack McLeod of Saskatoon, Lorne Davis of Regina, Don Raleigh of Winnipeg, Murray Wilkie of Winnipeg, Murray Costello of Ottawa. 10. FP, 17 January 1957, 15 February 1961, 24 April 1961, 27 June 1961; 28 August 1961; Winnipeg Tribune (hereafter Trib. ), 22 March 1961, 23 March 1961, 28 March 1961, 30 March 1961. After the 1960-1961 season Jack Perrin asked for a “leave of absence” from the Western League, and received it. Technically, it is not accurate to say the team “folded,” although in effect that’s what it did. 11. Trib., 18 March 1959, 2 April 1959, 11 April 1959, 16 April 1959, 20 April 1959, 30 Apri1 1959, 4 May 1959, 22 May 1959; FP, 17 March 1959, 27 March 1959, 20 April 1959, 22 May 1959. 12. Trib., 22 May 1959; FP, 22 May 1959, 21 January 1991. 13. FP, 20 January 1991, 21 January 1991, 22 January 1991, 3 November 1992, 14 February 1993, 14 April 1993. 14. Trib., 30 March 1961; FP, 27 June 1961, 29 August 1961; J. M. Bumsted, “Canada and American Culture in the 1950s,” in J. M. Bumsted (ed. ), Interpreting Canada’s Past, vol. II, After Confederation (Toronto: Oxford University Press, 1986), pp. 398-411. 15. In professional sports, winning teams almost always do better at the gate than losing ones. See Henry G. Demmert, The Economics of Professional Team Sports (Toronto: D.C. Heath and Company, 1974), pp. 10-11, 67. 16. FP, 17 January 1957, 7 March 1957, 27 March 1957. 17. HN, 5 October 1957, September 1958, 11 Febuary 1961; Saskatoon Star-Phoenix, 2 September 1958, 7 November 1958, 14 February 1959; FP, 2 September 1958, 6 November 1958, 14 February 1959. 18. HN, 22 March 1958; FP, 14 October 1957. 19. Two good overviews of television and its initial effects on sports are Benjamin G. Rader, In Its Own Image: How Television Has Transformed Sports (New York: Free Press, 1984), and Randy Roberts and James Olson, Winning Is the Only Thing: Sports in America since 1945 (Baltimore: Johns Hopkins University Press, 1989), pp. 95-111. 20. Rader, chapter 4, especially p. 59. 21. Paul Rutherford, When Television Was Young: Primetime Canada 1952-1967 (Toronto: University of Toronto Press, 1990), pp. 49-50; Michael J. Doucet and Margaret Hobbs, “The Growing Popularity of Television,” in Donald Kerr and Deryck W. Holdsworth (eds. ), Historical Atlas of Canada, Vol. III, Addressing the Twentieth Century (Toronto: University of Toronto Press, 1990), plate 65. 22. Rutherford, pp. 241-254, passim. ; Susan M. Nattrass, “Sport and Television in Canada: 1952 to 1982,” (PhD dissertation, University of Alberta, 1988), pp. 37-53, passim; Joan Dixon, “From ‘Sports College” to ‘Sports Weekend’: An Examination of the Relationship Between the Canadian Broadcasting Corporation and Sport, 1936-1982,” (MA thesis, Carleton University, 1984), p. 39; FP, 12 October 1956. 23. Interview with Murray Costello, Ottawa, 25 May 1992. Costello is now President of the Canadian Amateur Hockey Association. In the late 1950s and early 1960s he worked for the Seattle Totems and then the Western Hockey League. 24. HN, 31 December 1960, 7 January 1961, 14 October 1961; FP, 14 February 1959, 7 April 1959, 8 April 1959, 11 April 1959. 25. HN, August 1959, August 1963; FP, 13 December 1958, 1 March 1960. 26. HN, 7 January 1961, May 1963; Edmonton Journal, 11 June 1966. 27. HN, August 1964, July 1966; FP, 16 September 1961. Victoria was without a franchise from 1961 to 1964, but then obtained the Denver team. This franchise lasted for three years. 28. Regina Leader-Post, 13 December 1955; HN, 2 October 1954, 31 December 1955, 28 January 1956, 5 October 1957, August 1959; Brandon Sun, 5 January 1956, 2 March 1957, 25 March 1957, 29 March 1957, 12 April 1957, 26 April 1957, 10 May 1957, 24 May 1957, 30 July 1957, 3 August 1957; Saskatoon Star-Phoenix, 22 February 1958, 18 April 1958, 6 May 1958, 5 March 1959, 10 March 1959, 3 April 1979. Actually, in 1957-1958, Piggott’s team played home games in both Saskatoon and St. Paul; in 1958-1959 all home games were played in Saskatoon. 29. HN, 21 March 1959, 28 March 1959, July 1961, September 1961; Trib., 19 March 1960; Saskatoon Star-Phoenix, 24 April 1959; FP, 8 January 1959, 13 February 1959, 21 April 1960, 15 February 1961. 30. Trib., 28 March 1960. 31. FP, 20 October 1960, 27 October 1960, 27 June 1961; City of Winnipeg By-Law No. 17834, passed 8 April 1957, in Bylaws, pp. 82-83; Legislative Assembly of Manitoba, Debates and Proceedings, vol. IV, 15-26 March 1960, pp. 1594-1982, passim. 32. Telephone interview with John Perrin, III, 29 May 1992. Jack Perrin died in November 1992. For about two years before his death; I tried to arrange an appointment to talk to him about the Warriors. He did not return my calls, although several years ago he did talk to me informally about his days as a hockey promoter. In 1986 he spoke with Mr. Tom Thompson of Winnipeg about the Warriors, and I have benefitted from Mr. Thompson’s recollections of the conversations. I should add that John Perrin III, who was involved in a minor way in his father’s hockey business, has been very helpful. 33. FP, 15 September 1959, 31 October 1960, 2 November 1960, 24 March 1961; HN, 15 October 1960, 12 November 1960, 7 January 1961, 25 February 1961, September 1961, 10 March 1962, June 1962, 2 January 1965, 30 April 1965; Gary Davidson with Bill Libby, Breaking the Game Wide Open (New York: Atheneum, 1974), especially chapter 9.